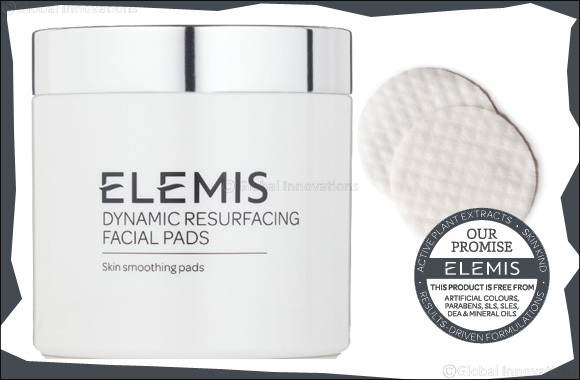 Powered by ELEMIS’ patented Tri-Enzyme Technology, these dual-action Dynamic Resurfacing Facial Pads gently smooth and brighten the complexion. These resurfacing pads, powered by ELEMIS patented Tri-Enzyme technology, act as a very effective, yet gentle skin perfecting exfoliator. An innovative and user-friendly treatment that enhances the Dynamic Resurfacing routine, replacing the need for harsh exfoliators. Targeting skin which appears dull and rough, it gently encourages the skins natural renewal cycle and prepares skin for optimum results from the rest of the range. Rejuvenates, revitalises and smoothes, while boosting radiance for a luminous complexion. ELEMIS' Dynamic Resurfacing Facial Pads will launch in Middle east in May 2018.